In May 2013 the University of São Paulo entrusted us with the construction of a large organ, that was meant to be both a concert instrument and a study instrument for organ students at the University. For several different reasons, the Auditorium where the organ was supposed to be installed was not completed, and the brand-new organ delivered on time, had to wait for better times in storage. It wasn’t till 2018 that a new home for this instrument was found in the Evangelical Cathedral, a new and permanent home. 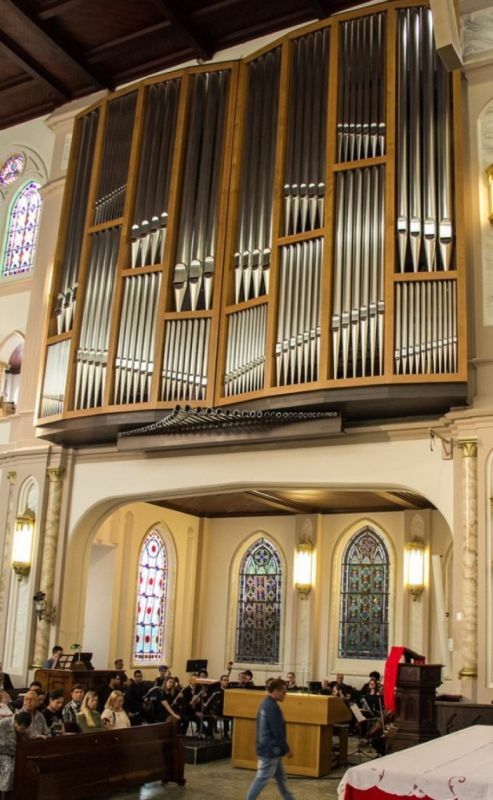 Our designer, Jordi Andujar, and his team finally found the way to install the organ in a side gallery, and the original mirror-flat front pipes were relocated harmonically in a unit with double 16’ pipes (Great & Pedal). And for the first time in our workshop’s history, we had to work on an organ with electric transmissions, so they could be put in two opposite facing fields. This transmission helped with the new adjustment in the Cathedral. The Opening concerts took place on 22 & 24 March 2019 with concert artists José Luis de Aquino, University organ professor, and Mácio Arruda, titular of the Evangelical Cathedral. The organists displayed the different facets of the new instrument: the organ soloist also played in collaboration with the University Symphony Orchestra of São Paulo and the Choir of the Orquestra Sinfônica do Estado de São Paulo. Audience attendance was at an all-time high for the events. An International Festival will allow the audiences in São Paulo to experience first-hand the versatility and multiple possibilities of this organ in the 11 scheduled concerts up to the end of June. The instrument itself belongs to the University and will be used to train organists as well as making the organ available for concert use. Thanks to the cooperation between all those involved, the instrument has found a new home and bright new possibilities for the future as a concert instrument, a musical instrument for aspiring organists as well as its new role as a liturgical instrument.